Late Monday, Republican Party presidential candidate Donald Trump launched an incredibly vulgar attack against Hillary Clinton, including a comment that was sexually derogatory about her in 2008. Trump said he is not sure who is worse between Obama and Clinton. He also said she was favored in 2008 over Obama and was beaten as well. Trump made some crude references to a bathroom break by Clinton during this past Saturday’s debate with the Democrats describing it as being disgusting. Trump asked what happened to Clinton? He said one minute he was watching a debate and then she just disappeared. This is not the first time that Trump has used vulgar language. Back in 2011, while he was talking about the race of the 26th District in New York he characterized the Jane Corwin loss as not just being a loss but of being schlonged by a Democrat. Corwin is Republican. 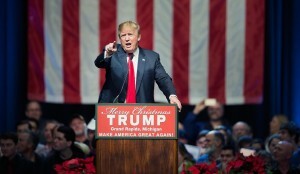 Trump launched some vitriolic attacks as well on his competitors in the Republican Party. He described the candidacy of Jeb Bush as sad, telling an audience in Michigan that the Bush family is ashamed of where he stands and his candidacy. Trump was indifferent about the decision by South Carolina’s Lindsey Graham to leave the GOP race. The two had sparred on frequent occasions. Trump said the news about Graham quitting was sad but that came with a faux-frown on his face prior to reminding the audience how nasty Graham was to him over the last couple of months. Trump made his punches at opponents, but he also had to dodge more than a dozen interruptions from a group of protesters that assembled in the crowd. These protesters are now common occurrences at Trump rallies, with causes from immigration to Black Lives Matter. Trump reacted to the protestors by urging calm, by joking he liked them to finally calling them a group of losers before he commanded security to get rid of them.